Left KLIA and arrived at Suvarnabumi Airport at 9.00 am. Arrived in a taxi to the PROPAK exhibition hall in Bangkok. Along with our luggages, we browsed the packing machineries booths for 2.5 hours. After dinner at night, I joined a colleague wandering around BKK city i.e the street markets, Central World and Siam Paragon. What I enjoyed most was getting to feast on dukong for only RM1.50/kg. You'll know how cheap it was if you're a fruit fan like me. 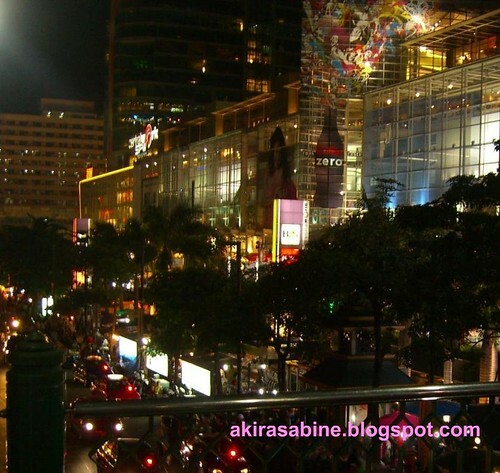 The grand Central World at night and busy traffic under this pedestrian bridge. Went to our office at Navanakorn, approximately 1 hour by van from our stay at Langsuan Street. Day started and ended at regular office hours but basically more of snapping pics and info gathering for works back home. Dinner was nice sumptious Thai Cuisine under company’s expenses with some of the superiors. No wandering for the night, too full to move and thus discovering what the hotel has to offer i.e the pool, gym, pool and mags room. Then, headed back to room to enjoy the luxury serviced apartment I had all by myself. After breakfast, we checked out and headed to the convention at a hotel. The convention was an annual event which the Thailand management organized to encourage its production team to contribute on cost saving ideas. Translation was made available through headphones for us simultaneously as the presentation was in progress. Though, I would say the translation did no good as there were even whispers behind. When it finally ended, I joined a colleague to our modest guesthouse at Saphan Kwai which we booked for the duration of our extension in BKK. Finding it wasn’t a breeze as we had to walk quite a distance and asked for direction. The map provided was not helpful. Checked in and yeah, life as travelers began here. This place typically accommodates young budget travelers/backpackers with basic amenities, bar, a common tv, reading room, social and internet room for use. All in all, we were satisfied to find it clean. After checking in, we set off to discover the town. It’s a small town compared to BKK but only a station away from Mochit where the Chatuchak Weekend Market is. 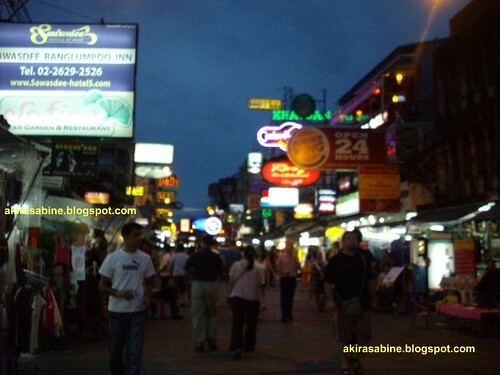 We surveyed the night street markets and tasted some of the street snack. I went for more dukong and crispy pancake while Aaron with porky snacks i.e grilled pig’s ear/tongue and crispy pig fat. I discovered that though we both like traveling, we do not concur on food. Then, headed to Big C(popular hypermart in Thailand) for so noodles. The street noodle stalls didn’t appeal to me. I was surprised to find there weren’t any tom yum noodles around but beef/ pork/duck soup ones. As it was the EURO 2008 season, the travelers were staying up with beer while catching the match on the tube as we returned. From the Saphan Kwai Skyway Station, we took the train to Victory Monument. Basically, we found out that the Monument stood right at a roundabout near the station. Next, headed to Phaya Thai to check out Panthip Plaza, the place equivalent to Malaysia’s Low Yat Plaza. I got my hp to PC’s USB/mini USB cord for only RM 5 instead of RM 25 here. Next, Silom for Lumphini Park, a place equivalent to Taman Tasik Perdana or Titiwangsa with lakes, exercise amenities, great sceneries and picnic sites before going moving on next to Saphan Taksin. Here at the pier, we took the express boat to Ta Tien Pier. Somehow, we shot past to the next pier and we took the opportunity to check out the Grand Palace. 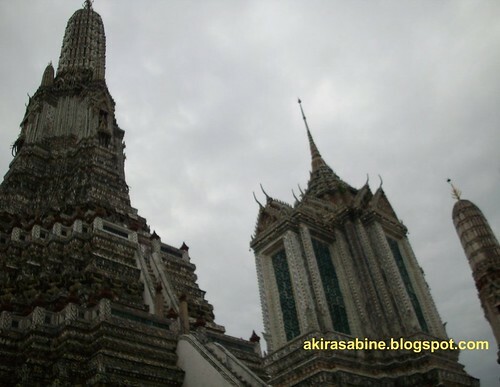 Then, crossing the river to Wat Arun, our desired destination. Having tried the train, taxi and boat, we tried the bus at Ta Tien Pier to National Monument and walked shortly to Khao San Road, the so-called traveller’s street with lotsa backpacker’s inn, bars, street markets and convenience stores. Indeed, it was happening with foreigners around us. Here, one can find various food, clothes, shoes, bags, accessories, street barbers, you name it. 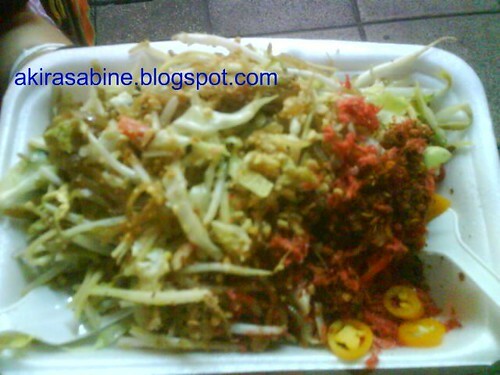 Phad Thai, the Thai style fried noodle was seen being prepared and sold here. I like it as it’s light/dry and not oily with lotsa nuts and dried condiments to nibble on. Without the additional chilli flakes, nuts and sweet sour sauce, I would say it’s quite bland. The noddle are the flat rice noodle mixed with some crispy fried one cooked to perfection with pork and lotsa beans sprout. A trip to Thailand wouldn’t be perfect without a ride on the tuk tuk. Set a price before getting into it and firmly object on making in between stops at jewellery stores as they earn fuel coupons this way. Our stop at MBK (National Stadium Station)did not last long as it was nearing the closing hour, so we strolled the sky walkway before calling it a day. 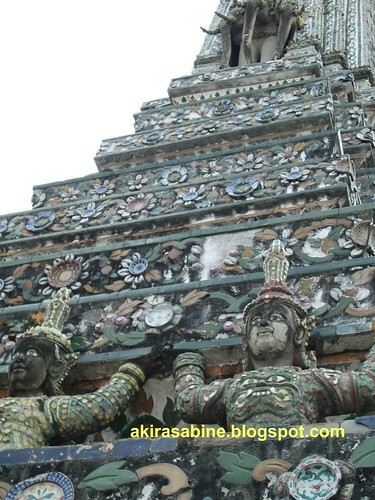 Managed to fit in 3 tips of the Wat Arun. 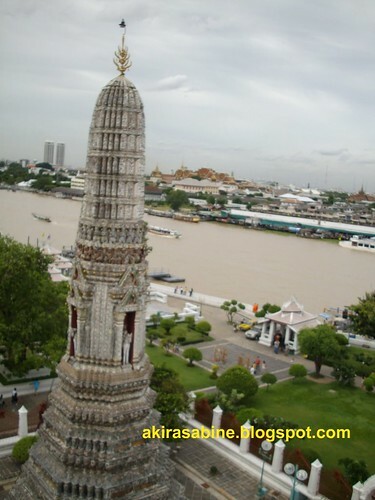 Chao Phraya River from the top of Wat Arun. A closer look at the structure. Khao San Road on a Saturday evening. Set off early in the morning to Chatuchak Weekend Market. It’s really damn big. Our last day was spent here alone before setting off to the airport. I managed to purchase a Deuter travel backpack for THB1000 though not the globetrotting largest. Somehow was happy with the purchase as one will never find one at this price back in M’sia. Though it’s an imitation made in Vietnam but the quality’s surprisingly good for 1/4 the price here. All in all, my trip here was one not without language blunders. 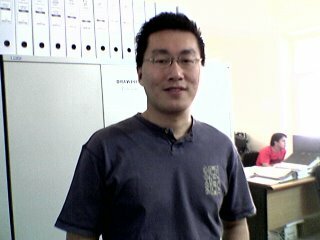 ME : Tao Rai ? ME : Lot noi dai mai? Seeing me leaving for other stalls..
Stranger : OK ..baht OK? Want how much? Ow tao rai? Sometimes, handing me his/her calculator. ME: Khao San Road yo ti nai? Stranger gave a blank face. Stranger finally got it and repeated the right pronounciation. He then gesture a straight line and right. Stranger nodded eagerly: Dtong bai, leo kwar ..
hahhah..."hai lo, paeng ma..." hahha... I remember hearing a joke about Malaysians saying "Hou paeng how paeng" complimenting the price, and got even more surprised when the hawker kept reducing it each time he said that. hahhaha. I miss Thailand... speaking here right now at my hostel in Vietnam. Aside from it's chaotic traffice, the people here is far different than those in Thailand. They give me the impression they love tourists only for their money. Everything you buy here has got a special rate for tourist. They'll try ripping you off your money whichever way possible. I'll write the whole story in my next blog. Been out strolling this chaotic city the whole day and been pestered non stop. Looks like I'm not the only one pissed off by their antics but the foreigners as well. What a waste, this country has so much to offer in term of magnificent sights! Heading to Halong Bay tomorrow. Wow, those are really great pics! I don't know how I would handle being hassled by merchants and people trying to sell me stuff all the time! Geez! You go on vacation to relax, and that does not sound relaxing! Be sure to take as many pics as you can! They look fantastic! Yea, it's pretty a put off being approached here and there. The trip was an eye opener but I did not actually expect it to be relaxing, really. As a matter of fact, I basically walked in those 6days more than I do at home in a month.